Le Petit Hotel management are regular visitors to China. China and France are connected by substantial trade ties. The effects of the historical political concession that resulted in an area of Shanghai being administered by France are still apparent. It is well worth the time doing the research to discover how this concession and others in Shanghai came about. 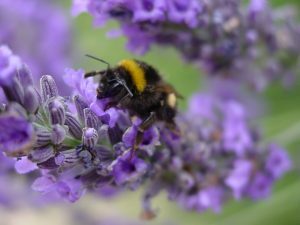 While the French have long departed from the concession, with very little effort , any visitor can quickly recognise the influence they left behind . Croissants, fresh breads, brioche and small delicate cakes are evidenced in hotel breakfasts, especially those that share a European breakfast menu with standard Chinese fare. Le Petit Hotel’s well known & truly loved Scottish Terrier finally succumbed to liver cancer in the early hours of Monday 28th September 2009. Although we had been expecting it, when the final hours came, it was truly heart wrenching stuff. As the old saying goes, she died with her boots on. I let her outside at about 2am for a little slow walk. She came back into the hotel, sat down by her water bowl for about an hour, with me beside her. About 4am I picked her up gently and made her comfortable on a rug on the floor, alerted Martine that the end was very near..and with us both beside her, after a few gasps, she gave up the fight……[ Insert: volumes of huge tears]….in her own way, her final parting gift to us…was for us not to have to call the vet. Maggie was “huge” in spirit, determination, & courage; sensitive to all those who had the privilege of meeting her, and above all an unlimited giver to those humans she had bonded so well with. Maggie was a dignified, exceptional character, no bite dog, who took time out to smell the flowers, taste the grass, look at birds with interest, and who could always see a cat at 1000 paces. Her joy at going for walks knew no bounds until age limited her outings. Maggie’s departure from this world has left a huge gap at Le Petit Hotel, Sumner, and irreplaceable memories with Bruce, Martine, Scott, & John. 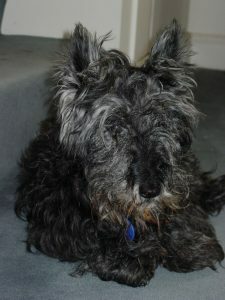 Bless her soul, Maggie was a dog apart, she lived happily with us, fought a good fight, and is at peace now. 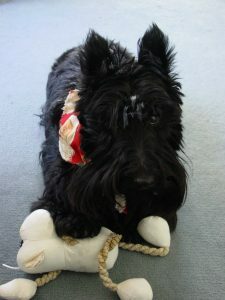 Maggie Whitfield; a Scottish Terrier, Born 13 December 1995, Died 28 September 2009 at Le Petit Hotel, Sumner, NZ. Pedigree of Greenock Mallaig, Sire: MacPrain Mintmaster & Dam: Shortbread Briar Rose. Black with some Brindle, her breeder was Adele Willis, 97 Soleares Avenue, Christchurch, New Zealand. She will be remembered.